Rather than listening to a mis-tuned radio station or dead air, use on-hold time to educate, inform, and entertain clients about products and services. Let On-Hold Advertising's "voice at your service" speak for you. Increase caller awareness, decrease caller hang-up, promote company services, introduce new products, and advertise specials. On-Hold Advertising uses professional tv/radio voice talents, experienced scriptwriters, completely custom programs, fully licensed music, digital recording studios, and programs for every budget. The professional staff at On-Hold Advertising is waiting to service your on-hold needs. A business' desire to announce information to their callers, along with the time clients are placed on hold, is high. What better opportunity can you have to promote your products and services to an already captive and interested audience? 1. How do I know if my phone can play music on hold? 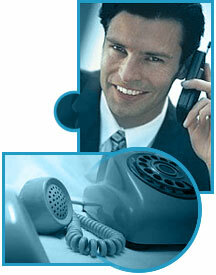 On-hold message programs will only play on phone systems with music on-hold capability. The phone system must have a switching box, sometimes referred to as the "brain" of the phone system. About 90% of the phones used in business environments have this capability. 2. If my phone does not have the capability, what do I do? Even if your phone does not have music on-hold capability, you can still have messages. Depending on what kind of phone you have, an adapter can be purchased that is made exactly for your phone. For example the OHP6500 and OHP7500 from On-Hold Plus.